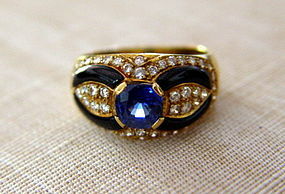 Stunning genuine Ceylon Blue Sapphire @ 1.22 ct., 52 brilliant Diamonds @ 0.56 ct. and hand carved Onyx ring set in 18K. solid gold. 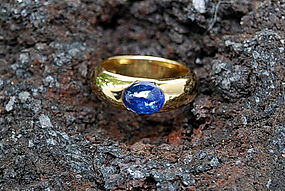 Finest Genuine Ceylon Blue Sapphire-Diamond Ring 18K. 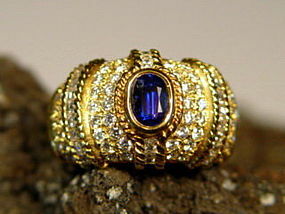 Genuine Octagon Ceylon Blue Sapphire-Diamond Ring 18K. Solid 18K. 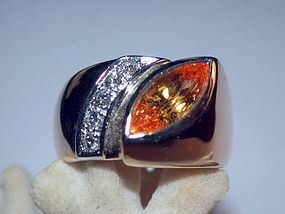 White Gold Ring (8.80 gr.) 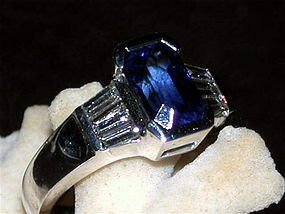 set with a fine and large octagon cut genuine Ceylon Blue Sapphire @ 2.46 ct. and 6 tapered Diamonds @ 0.59 ct. Solid 18K. White Gold Ring (5.49 gr.) 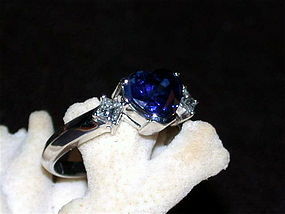 set with one very fine genuine heart shaped Ceylon Blue Sapphire @ 3.11 ct. flanked by 2 square Diamonds @ 0.26 ct. Solid and stylish 18K. 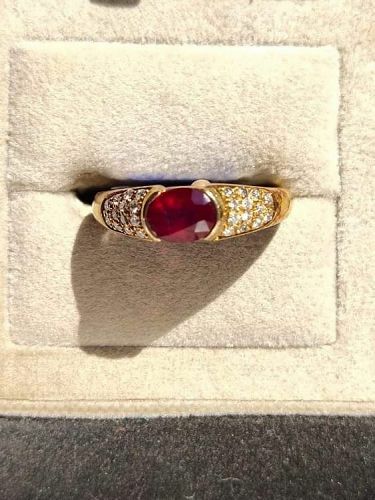 Gold Ring (7.52 gr.) 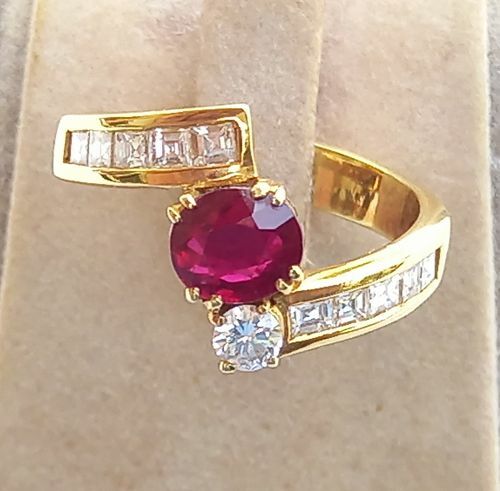 set with one Diamond @ 0.23 ct. and one Ruby @ 0.75 ct. Finest 18K. Gold (8.05 gr.) 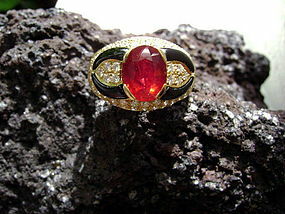 Filigree Ring set with a genuine Ruby @ 0.23 ct., 2 brilliant Diamonds @ 0.06 ct. and 82 Diamonds @ 0.32 ct. 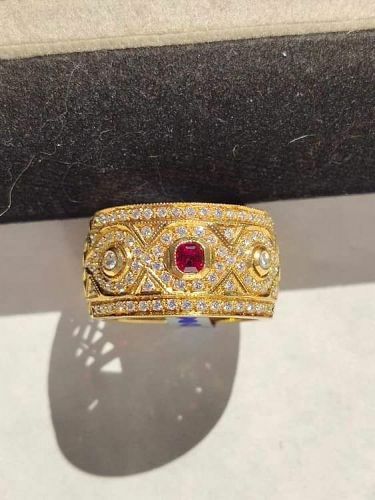 Stunning solid gold 18K. 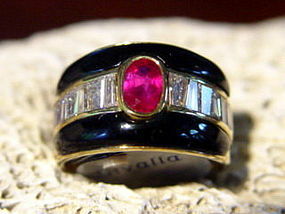 ring set with a fancy cut genuine Ruby @ 0.55 ct., and 33 Brilliant Diamonds @ 0.54 ct. total weight. Attractive 18K. 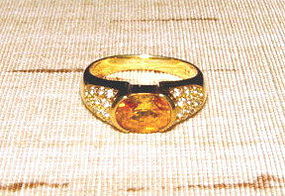 Gold Ring (10.5 gr.) 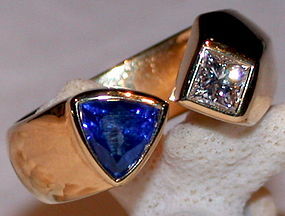 set with one genuine Blue Ceylon Cabochon Sapphire @ 3.15 ct. Stylish 18K. 2-Tone Gold set with an attractive genuine Golden Yellow Ceylon Sapphire, Marquise cut, @ 1.85 ct., and 5 Brilliant Diamonds @ 0.19 ct. total weight. Most unusual and stunning genuine fancy trilliant cut Cornflower Blue Ceylon Sapphire @ 1.07 ct. and Princess Cut Diamond @ 0.29 ct. Ring set in 18.K. Gold (8.24 grammes). Very stylish. 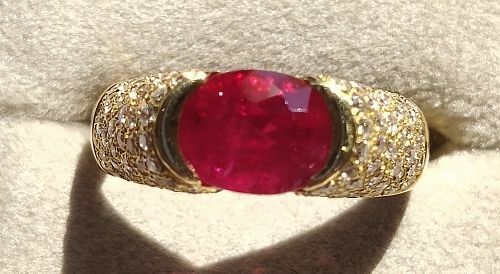 Impressive genuine ruby @ 2.40 ct., set with 108 brilliant diamonds @ 0.66 ct. total weight in 18K. gold. Solid 18K. 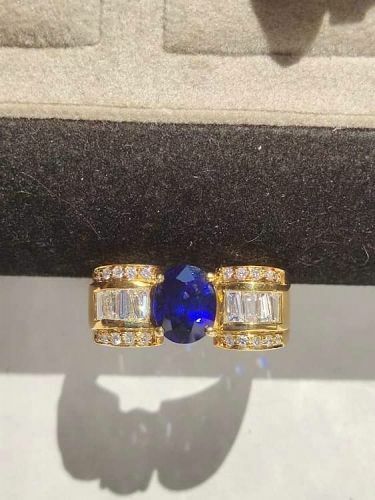 Gold Ring set with a Genuine Ceylon Blue Sapphire @ 0.92 ct., 22 Brilliant Diamonds @ 0.49 ct. total weight, 68 Brilliant Diamonds @ 0.74 ct. total weight. 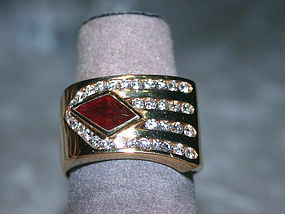 Very fine 18K. 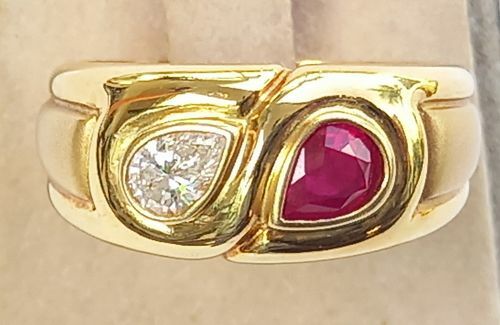 Gold Ring set with 2 superior genuine octagon-emerald cut Rubies @ 0.66 ct. total weight, 10 tapered Diamonds @ 0.31 ct., 32 brilliant Diamonds @ 0.22 ct. total weight. This stylish design is reminiscent of a wave. !8K. 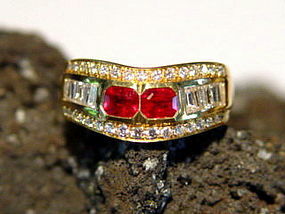 Gold Ring set with one Genuine Ruby @ 1.04 ct., 1 Diamond @ 0.13 ct., 10 square Diamonds @ 0.49 ct. total weight.